WATCH: Was Ben Pearson lucky to escape after rash tackle on Derby's Tom Lawrence? Gary Rowett and Keith Andrews felt Ben Pearson was lucky to stay on the pitch following his late challenge on Tom Lawrence. 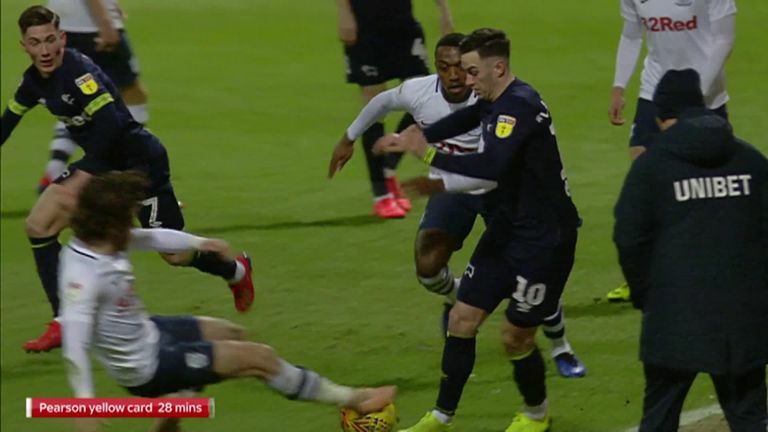 Preston midfielder Ben Pearson was possibly lucky to escape a red card in his side's goalless draw with Derby on Friday evening. That was the view of Sky Sports pundits Gary Rowett and Keith Andrews after the stalemate, though referee Darren Bond produced just a yellow card as a punishment for the tackle. Pearson himself, along with North End boss Alex Neil, reacted furiously to the decision, however television replays showed Pearson caught the Rams winger clean on the ankle in the process. The player's disciplinary record is eye-catching, with the 24-year-old having been shown 23 yellow cards and three reds since the beginning of last season, yet he continues to lunge into challenges, as this evening proved. Both Rowett and Andrews suggested Preston midfielder Pearson should have been shown a red card for the challenge and you can click on the video to decide whether or not you agree.